"So what are you making for dinner? ": Take Me Out To The Ballgame and New Pizza Place! Today Chris and I went to Yankee Stadium for Old Timer's Day! We had the most incredible seats! 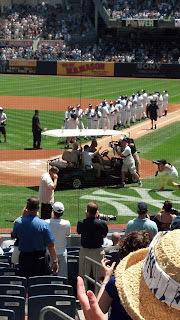 The Yankees lost the game but we got to see Paul O'Neil, Molly's brother, Bernie William, and a lot of other legends. But my favorite was Yogi Beara. He is so cute! We did eat at the stadium. Only problem was the heat. It really was not conducive to eating. Consuming liquid was more important. I had an amazing 300 calorie, yeah the calories are posted, Fresh Lemonade. Talk about refreshing! And only $5.25. We each had a Philly Cheese Steak but that was it. So needless to say we were hungry by the time we got home. A new pizza place opened not too far from us, New Haven Appiza and Bakery. I ordered 2 subs when we were driving home from the train station. Chris got the Chicken Parmesan, the Wooster Street. I ordered the Eggplant Parmesan, the Trumbull Street. 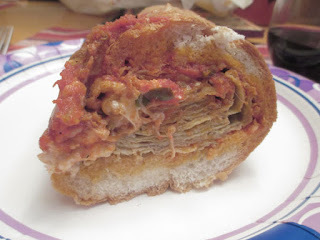 The eggplant was perfect and I am pretty sure Chris liked his Chicken Parmesan. Unlike the Yankees today neither one of us left anything on the plate!